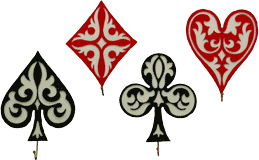 Things with Playing Card Suits Motif. Card lovers of all kinds will find something here to tickle their fancy. Bridge is a timed event! For those days we have to go outside! Easy to use, Place the purse hanger on the edge of the table and hang your purse on the hook.